It’s the first weekend of Spring, and while the Midwest and Eastern sides of the country are still bundled up Seattle is in full bloom; cherry blossoms and daffodils are bursting onto the scene in a joyous visible choir of life. The farmer’s market is still shelling out the last of the winter produce – lots of hearty greens, tubers, and carrots, but the larger grocery stores are reminding us of what is to come with berries and asparagus flown in from Latin America. Thanks, Whole Foods, but I think I’ll pass until I can get the home grown stuff! Spring is a season of cleansing and renewing, when both the Earth’s natural abundance and our internal desires often turn to that which is energizing, fresh, revitalizing and alive. The allure of heavy stews and mashed potatoes fall away and, I at least, start fantasizing about finally buying that juicer and stay up too late exploring all the different ways I can prepare watercress on Google. Many people start sending in email inquiries or calls regarding cleansing and detoxifying; the extra daylight hours and warmer weather wake up the populace and stir motivation to take action! This season is very supporting of a cleanse, and definitely the best time of year to take one. It can be very helpful for digestion, seasonal allergies, and also offer a mental shift for those who crave a program to get on track with healthier eating. If you are unable or uninterested in taking on a formal detoxification program, you can still get a gentle ‘cleansing’ effect simply by focusing on the local produce this season. Berries, tender leafy greens and sprouts (omg – have you ever had garlic scapes?!? They are the sprouts off garlic and they are quite lovely – and only available about 2 weeks out of the year!) …where was I? Oh, yes – berries, sprouts and especially the tender greens of spring have a gentle cleansing effect on the lungs and liver; according to Chinese medicine, if the liver’s energy is sluggish or burdened it can show up as seasonal allergies. One of the ‘side effects’ we see with eating spring foods in our detoxes is a lightening or absence of seasonal allergies. The foods of spring are also low in calories and high in nutrients and fiber; this is a naturally fabulous combination to have when looking to shed excess winter fat from the body. Spring greens are a great intro as far as green leafies go; their milder taste is better suited to an American palate (which tends to turn it’s nose at heavier, bitter winter greens). They also require very little food prep and are best enjoyed raw, and thus are easy to prepare. Greens can be intimidating to work with if you are unfamiliar with them, but often keeping it simple is the best way to go – it eases the transition in introducing the vegetable to your palate and allows the green to retain some of it’s individual characteristics so you can get to know it better than you would were it drowning in butter or a heavy dressing (which spring veggies don’t typically do well with, anyway). Serendipitously, I came across the recipe book below while writing this post: Here are 18 lip-smackin’ recipes from our alma mater Institute of Integrative Nutrition, offered up with spring in mind! Comment below and let me know what your favorite part of spring is! I’m excited for all the great produce heading into town; how about you? It’s still a little chilly, but signs of spring are coming. This recipe is a wonderful choice for spring or winter – dandelion greens are a great spring green, rich in highly absorbable calcium as well as iron. To make this recipe in fall or winter, substitute a heavier green like collards or kale! 1) Wash greens and remove the tough, fibrous stem bottoms. Coarsely chop. Bring a pot of water to a boil, and blanch greens for about 1 min. Drain in a colander and run cold water over them to cease cooking. 2) Heat oil in a skillet over medium heat and saute shallot until soft, then add garlic and mushrooms, cooking about 4 min. more. 3) Stir in greens, ginger, and tamari. Cook 3 additional minutes, then remove from heat. 4) Toss with optional lemon juice before serving. This recipe is an adaptation of my apple gorgonzola fettuccine recipe. Now that I live in San Diego, the local produce is a little different than the pacific northwest. The result of playing with what we could find at the farmer’s market was delicioso! 1. Cook pasta in salted water according to package directions. Place chopped kale in cooking water before draining pasta, and drain pasta when kale is bright green and lightly blanched. 2. Melt one Tbsp of butter in a pan, and saute the minced garlic until soft. 3. Add the rest of the butter to the pan, then the hazelnuts and persimmons and saute until the persimmons are just heated through – make certain the fruit does not become soggy! 4. Add the cooked fruit and nuts to the drained pasta and kale. Toss well. Crumble in Gorgonzola and cracked black pepper and toss again. Serve immediately, and sprinkle pomegranate seeds on top. New Ways to Get Creative and make food fun! Like everyone, I tend to get in food ruts. Once a month I like to shake things up by broadening my culinary creativity. A standard monthly visit to the local Asian grocery store is always exciting. Having been raised in Western culture, many of the fruits, vegetables, and packaged goods are new and mysterious. So on every visit I pick a vegetable I am unfamiliar with. Last month I chose lotus root. It was crispy like water chestnut, but lovely in shape and added a touch of elegance and sophistication to my Sea Goddess Saute’. This month I’ve chosen bac ha. I’ve never seen it or heard of it before. 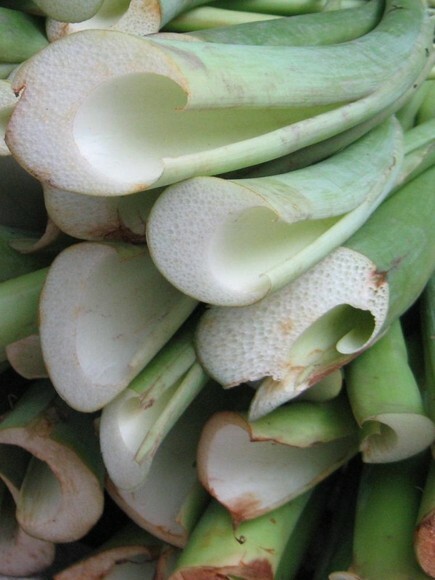 It is a stalk like celery or bok choy but has a spongy looking interior, like bone matrix or your bathroom sponge. It is a green vegetable. I’ve brought it home and googled it’s name. From this I have discovered that it is known as taro stem and elephant ear. I’ve also managed to take home a vegetable that must be cooked, lest microcrystals of calcium oxalate irritate my mucous membranes. Never a dull moment in my kitchen! What I’ll do next is find a recipe that uses this vegetable, further expanding my culinary horizons and adding a new recipe to my ever-growing list. It seems most common in Vietnamese food, and you’ll be certain that whatever the winning recipe is, it will be posted here! This method of exploring new foods also works well to get children to eat produce. Bring them to the grocery store and have them each pick out a fruit or vegetable to try. Have them help prepare the produce as age appropriate and they will be more likely to try it! Why wait for the weather to change? Planting an indoor herb garden can be an easy way to introduce yourself to the joys of gardening and is a wonderful way for gardeners to get their gardening-fix even during darker, colder months. Tending to plants can be very relaxing, therapeutic, and rewarding. Harvesting fresh herbs for spaghetti sauce, stews, and broiled meats gives your food a flavor which rivals your favorite restaurants! It is far less expensive than buying herbs in the store, and since it is a living plant, you never have to worry about the excess rotting in the fridge! A Window – ideally with Southern exposure in winter. If you live in a dark place, you can use full-spectrum lamps to keep your plants happy! Herbs – choose plants which you will actually use (I rarely use marjoram, even though it grows easily). My favorites – basil, thai basil, lemongrass (not an easy one to grow), cilantro, and oregano. You can start from seed if you wish, or purchase starter plants from your nursery. Several small pots with holes for drainage – individual pots will allow you to keep an easier eye on each plant and its needs. If space is of concern, you can group them in one container, but growth may be compromised if your herb choices have differing needs. Organic Soil – Choose organic, compost-rich soil for your plants. It containsÂ a wider spectrum ofÂ nutrients and beneficial organisms than standard potting soil. Plant food — worm castings, worm tea, PlanTea, or fish emulsion among others to give your herbs once a week. For actual planting, this video is a basic how-to. For some medicinal qualities of common herbs and spices we use in cooking, check out this blog post! Herbs have been used for centuries to not only flavor our meals, but to provide powerful medicine to keep the body healthy and strong. Below are some of the medicinal properties of herbs commonly used in cooking. Growing fresh herbs in your home is a wonderful way to not only give your food spectacular flavor, but boost your immune system, prevent food poisoning, and give your body powerful plant medicine! Oregano: oregano is a strong antimicrobial, antiviral and antifungal. The aromatic oils in this herb offer natural food preservation due to these qualities, and have been used for thousands of years to treat bad breath, arthritis, cough, wounds, andÂ bacterialÂ & fungal infections. Oregano also has anti-inflammatory and antioxidant qualities as well and may prevent cellular damage. Basil: Basil is great for cardiovascular health, promoting lowering of cholesterol, stable blood sugar, and supporting the body’s ability to cope with stress. It contains triterpenoidsÂ (similar to ginseng, eleuthero) giving the body resistance to internal and external stressors. It has sedative, calming qualities and is often prescribed to alleviate anxiety (Holy Basil specifically is renowned for this). Traditionally it has been used for stomach aches, nausea, mouthwash, headaches, urinary complaints, and healing infection. Like oregano, it contains many antimicrobial properties and has powerful amounts of antioxidants. Rosemary: a natural mood booster and energizer, rosemary has been used in aromatherapy for centuries to facilitate memory and boost mood. Medicinally, this herb have been used to soothe and facilitate the digestive tract and reduce anxiety. In ancient times, many Western cultures wrapped their meat in rosemary to retard spoilage. Rosemary can also be added to oils and used to massage achiness out of sore muscles. Cayenne: as anyone who has tasted it knows, cayenne is potent! It has a strong ability to bring circulation and movement to the body, benefiting the joints (it’s an ingredient in many arthritis creams), heart, and speeding healing. Cayenne can be sprinkled in your socks on a cold day to keep your feet warm and is an essential addition to natural cold and flu therapies. It helps expel mucus from the body, kill infections and stimulates saliva and stomach secretions to improve overall digestion. Cilantro: this herb is commonly seen in salsas and guacamole. Like the other medicinal plants listed here, cilantro is a great digestive assistant and reduces gas. It has been used traditionally to ease anxiety and (for what it is worth) one study with mice supports this. (Can we rule out the placebo effect here?) In the United States, the leaves of this plant are known as cilantro, its seeds are known as coriander.Â Dodecenal, a compound found in the fresh leaves, is shown to kill the Salmonella bacteria. It seems logical that its popularity occurs in regions where heat (Mexico, India) cause rapid spoilage. To get started on your own indoor herb garden, click here! It’s playtime in the Dream Kitchen! TheDailyGreen.com offers a beautiful pictorial of the top 12 foods to purchase organic. Click here to find out which foods are best purchased organic. My favorite holiday food growing up was my mother’s sweet potatoes. The recipe had been passed down from my great-grandmother and unlike most family’s marshmallow-laden recipe, ours was studded with pecans and brown sugar. Often called yams, the dark orange fleshy tubers we enjoy every holiday (canned, marshmallow-laden or otherwise) are actually sweet potatoes. These foods come into season November and December, but are available year round for our enjoyment. They are an ideal winter food – heavy and warming with a sweet taste that satisfies cravings that peak during dark months. Rich in beta-carotene, sweet potatoes give us the precursor to Vitamin A that is essential for night vision. They are a perfect example of how nature gives us the appropriate foods at the appropriate time of year. 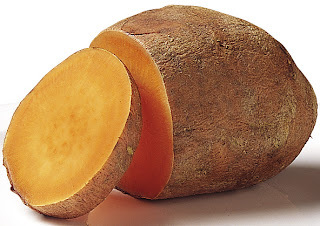 Sweet Potatoes, despite their candy-like flavor (which is enhanced by roasting or broiling) are low in the glycemic index and do not cause the spike in blood sugar white baking potatoes can, making them a preferred food of bodybuilders, diabetics, and those following a low glycemic diet. They are rich in soluble fiber, B6 and potassium, all heart healthy compounds which protect against heart disease. The sweet potato is also rich in powerful antioxidants which protect against inflammation and certain cancers. This wonderful whole food is a great way to get healthy, nutrient rich carbohydrates that will not adversely affect your blood sugar or weight. For the next few months, replace steak fries with baked sweet potato fries and white rice or mashed Russets with mashed sweet potatoes. Enjoy them in savory and sweet dishes! Below is a recipe for Sweet Potato Fries. I encourage you to give them a try for dinner one night. If you have a favorite sweet potato recipe you’d like to share, I’d love to see it! Preheat oven to 425 degrees (220 degrees Celsius). In a mixing bowl, toss sweet potatoes with oil and spices. Place potato wedges evenly on a baking sheet with enough space between each wedge to allow them to get crispy. Bake for 10-30 minutes (depending on size), flipping the over halfway through to brown all sides. When finished, they should be crispy on the outside and soft on the inside. Cool for 5 minutes before serving. Leafy greens are some of the easiest and most beneficial vegetables to incorporate into your daily routine. Densely packed with energy and nutrients, they grow upwards to the sky, absorbing the sunâ€™s light while producing oxygen. Members of this royal green family include kale, collard greens, swiss chard, mustard greens, arugula, dandelion greens, broccoli rabe, watercress, beet greens, bok choy, napa cabbage, green cabbage, spinach and broccoli. How do greens benefit our bodies? They are very high in calcium, magnesium, iron, potassium, phosphorous and zinc, and are a powerhouse for vitamins A, C, E and K. They are crammed full of fiber, folic acid, chlorophyll, and many other micronutrients and phytochemicals. Their color is associated with spring, which is a time of renewal and refreshing, vital energy. In traditional Asian medicine, the color green is related to the liver, emotional stability and creativity. Greens aid in purifying the blood, strengthening the immune system, improving liver, gall bladder and kidney function, fighting depression, clearing congestion, improving circulation and keeping your skin clear and blemish free. 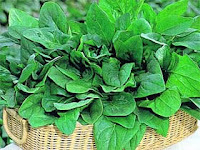 Leafy greens are the vegetables most missing from the American diet, and many of us never learned how to prepare them. Start with the very simple recipe below. Then each time you go to the market, pick up a new green to try. Soon youâ€™ll find your favorite greens and wonder how you ever lived without them.